Leaf removal may be required by your Homeowners’ Association. Adjust your lawn mower to cut your grass short in the autumn — much, much shorter than you would normally do in full summer, when keeping its roots covered is important to hold in moisture. This way, the leaves falling from your trees are less likely to get caught in the grass. 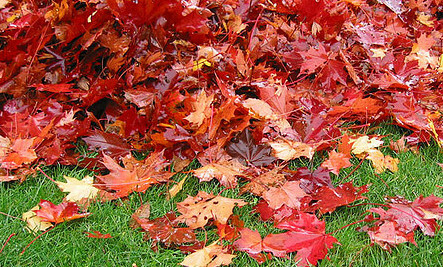 Make use of some simple low-tech tools to help with leaf collection. For example, an extra-wide 30″ rake with special non-clog tines will simplify and speed up your task. Keep up the good work by utilizing your new utensil to rake leaves onto a tarp. Then use a leaf chute to help load your cargo into brown paper bags for curbside pickup by your municipality. If you have a spare corner of garden available, compost not just the fallen leaves but all garden waste. Add some ripped up corrugated cardboard to the compost heap/bin and you can put lawn-mowings in there too. Turn the heap after 12 months (it helps if you have more than one compost bin) and the following year you will have the loveliest compost for your garden. No electricity, petrol or diesel necessary! Compost heaps are also wonderful habitats for all kinds of things that are beneficial to your garden - earthworms etc. I like raking leaves, it's part of fall. However I garden for other people and since I have a lot of leaves to rake, I lift weights so it doesn't bother my arms as much. I use some of the leaves around perennials to help them survive the winter - roses and such. I don't like to cut my lawn short, but will give that a shot this year to aid in raking.